More than 90 percent of French Muslims voted for Hollande, enough to defeat Sarkozy. Now, Hollande appoints three Muslims to his cabinet. Newly elected French president Francois Hollande has appointed three Muslims to his 34-member cabinet following his victory, in which the Muslims’ 93 percent support for the left-wing Socialist candidate put him over the top to defeat incumbent Nicolas Sarkozy. Hollande won by a scant 2.3 percent margin. Approximately 1.7 million Muslims voted for Hollande, who won the election by only 1.1 million votes. At least two of the Muslim cabinet members are foreigners, Najat Vallaud-Belkacem, born in Morocco, and Yamina Benguigui, an Algerian native. Both are women. The third Muslim cabinet member is Kader Arif, who has charged that Israel blocked Sarkozy’s proposed Mediterranean Union. 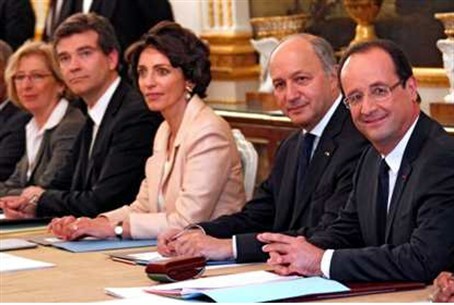 Hollande also has promised that women will comprise half of his Cabinet. The Muslim support for a Socialist candidate is due in part to the high unemployment and relatively low income of Muslims in France. In other European countries, Muslim support gave Socialists a victory in Denmark last year, the London Telegraph noted. The Muslim representation in Hollande’s cabinet ostensibly reflects the estimated 10 percent of the French population that is widely considered Muslim. However, France does not officially record its residents' religion, and the estimates include people who came from predominantly Muslim countries but who do not necessarily practice the religion. On the other hand, the Muslim population in France, as in the rest of Europe, is ballooning because of immigration and high birth rates. The population of France is approximately 65 million, and estimates of the Muslim population range from 4.7 million, as estimated by a Pew Forum study, to 7 million.